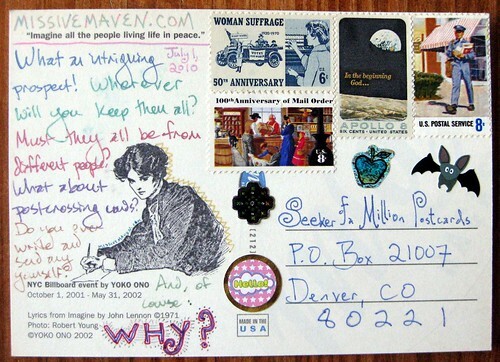 Somewhere, through someone else's mail or postcard blog, I saw a link to Sendmeamillionpostcards.com. Hmmm. Interesting. So of course I had to send one. 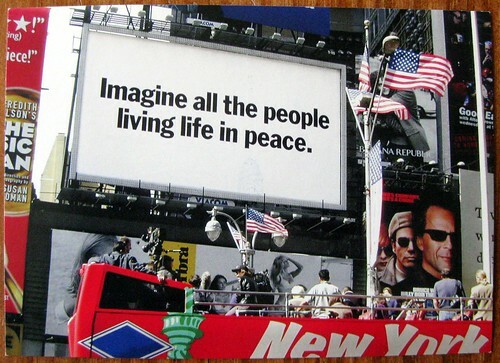 The postcard front isn't terribly exciting, but a cool billboard message from John Lennon in NYC, so since someone will ask, there you see it. The curator must have agreed that my decorated side was more interesting than the front, since that is what got uploaded to the site. Check out Send me a million postcards if you're looking for a place to send a postcard. As of this writing, the mysterious postcard collector has only received 295 postcards, so there are still 999,705 to go! I did get a response, which I will eventually post... someday. Cool! I think I will send him/her a postcard! 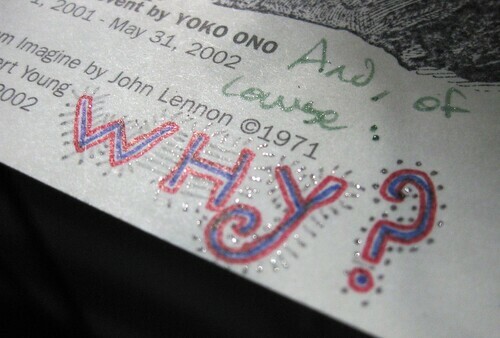 I don't know, I find the lyrics of "Imagine" incredibly exciting. :) I'll definitely check the site out! Postcard stock is about 250 gsm, and a postcard is about 150 cm^2, so a million postcards should weigh about 3,750 kg. Unless I've slipped a decimal point somewhere--it is Monday morning. A stack of one thousand sheets of 12 point stock is 12 in high, so a million would be 1,000 feet high. Better get the large size storage unit. Yes, I only post the backs.... Every other website posts the fronts so I wanted to be different. I just received my 300th postcard. With your post, I suspect I will receive a few more. Thank you! Joseph: Yes, your calculations seem about right. about 10,000 lb of postcards. I estimate they would fit in a room the size of a jail cell. MPC, thanks for the info about the comments at the bottom of your postcard page. I never knew that! I do hope this blog post helps you gather some more postcards. I will have to send a PC their way.